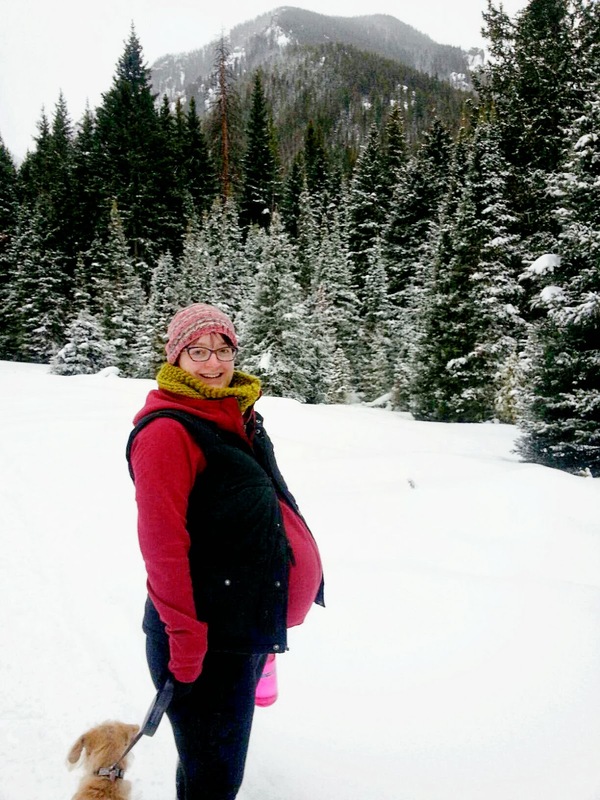 There are so many preconceptions and expectations surrounding pregnancy and birth. Patrick and I spent months and months planning for, dreaming about and picturing Grayson's birth. We wanted a natural birth. We expected it to take between 12-15 hours (average for first-time mom). We expected Grayson to weigh around 8 pounds when he was born. We expected that it would be challenging but neither of us anticipated just how difficult/exhausting/terrifying it would be. To start with, Patrick was sick. The sickest I've seen him in years. We took him to the doctor the day he started feeling badly - not the flu (thanks to the flu shot) - but some nasty bug going around. Because of this, I had stopped actively trying to go into labor (stomping around outside in the snow, eating spicy food, etc.) as I didn't want it to happen when Patrick was still feeling lousy. But the morning of the 29th, four days after Grayson's estimated due date, Patrick started feeling better. My dad suggested that we go for a short hike to help labor get started. So we drove up Hyalite Canyon and hiked the half mile trail to Palisades Falls. The drive itself was stressful enough - we even got stuck briefly in the powdery snow when the tires of Rhino (my sister's Exterra) got off the tire tracks a little. Luckily a group of about 15 snowshoers just happened by and helped push the vehicle out of the deep snow and back onto the road. Ready for the hike at 40 weeks plus 5 days. The hike was pretty exhausting, despite it's "easy" rating. At the top of the hike, I sat down on a tree stump and watched the crazy people attempt to climb the waterfall. 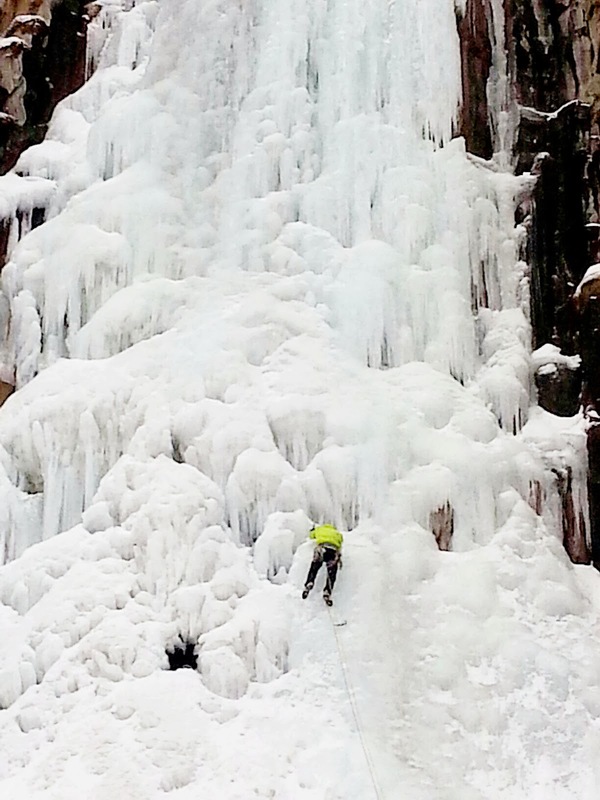 Ice climbers at the Falls. As I sat there, I felt something a little different. I had suspicion that my water had broken, but I wasn't sure. We headed back down the trail and I brushed off the feeling that maybe I had started labor. We got back home and the evening progressed normally. After the long day, I went to bed early. Around 10 pm, I started feeling contractions. Or what I thought could be contractions. I wasn't sure since I'd been having braxton hicks for weeks. I told Patrick I thought this could be it, and we started timing the contractions. Eventually it became apparent that these weren't going away, that they were getting longer and stronger, and that I was in true labor. Patrick woke my family and let them know that this was it. He also called our midwife, who advised us to wait until the contractions were longer and a shorter time apart before heading in to the hospital. Patrick made me a bubble bath and we rode out the early contractions. Around 4:30 am, they got to the point that my midwife had indicated would be a good time to head in. I figured after laboring at home for around 6 hours, that I was approximately half way, or a little less through the labor. We arrived at the hospital and got set up in a room. I had already pre-registered and my midwife had called to let them know I was coming in so that part was easy. The nurse on call wanted to check me so she could let my midwife know how things were progressing. Like I said, I figured I was around a 5 or 6 cm dilation, or about half way there. She checked me and declared I was at 2 cm. I'm pretty sure I would have punched her in the face if I'd been able to. She seemed ready to send me home as she figured this was false labor. Just to make sure, she did a test to check if, in fact, my water had broken. Sure enough, it had. This started the clock. Standard medical practice doesn't like the water to be broken for more than 24 hours before the baby is born. It can cause infection and possibly lead the baby into distress. So my midwife Cassie arrived, ready to get this baby born.